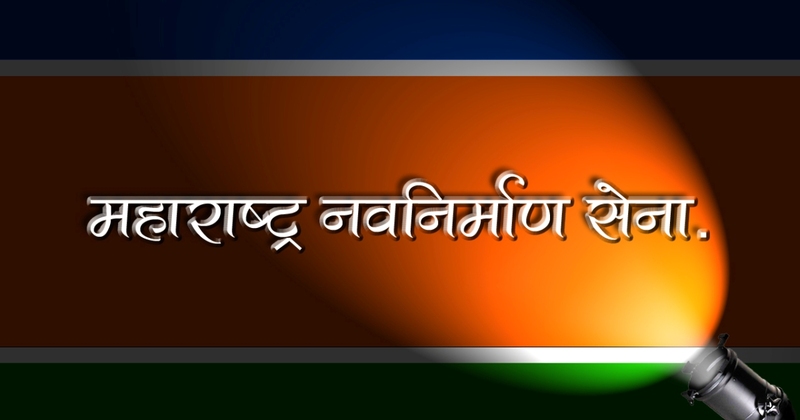 The Maharashtra Navnirman Sena (महाराष्ट्र नवनिर्माण सेना) is a Maharashtrian Nationalist party based in Maharashtra and operates on the motto of “Sons of the Soil”. It was founded on 9th March 2006 in Mumbai by Raj Thackeray after he left the Shiv Sena due to differences with Uddhav Thackeray and sidelining in major decisions like distribution of election tickets. The party was founded by Raj Thackeray, nephew of late Shiv Sena leader Bal Thackeray. Raj Thackeray resigned from his uncle’s party in January 2006 and announced his intention to start a new political party. Also Thackeray declared his motive of building a political awareness for the development related issues of the state and giving them a center stage in national politics. At the time of the party’s foundation, Raj Thackeray stated that he does not want to have hostilities with his uncle who “was, is and always will be (his) mentor”. Although the MNS is a break-away group from the Shiv Sena, the party is still based on Marathi and Bhumiputra ideologies. When unveiling the party in an assembly at Shivaji Park he said, that everyone is anxious to see what will happen to Hindutva. When unveiling, he also said, “I shall elaborate on the party’s stance on issues like Sons of Soil and Marathi, its agenda for development of Maharashtra and the significance of the party flag colours at the March 19 public meeting.” Raj Thackeray considers himself an Indian nationalist. The party also recognises secularism as one of its core tenets. The MNS has received support from local Marathi speaking Muslim community of Maharashtra. Many actors from Marathi Cinema, like Nana Patekar, Ashok Saraf, Prashant Damle, Kuldeep Pawar and Mohan Joshi have come out in support of “son of soil” theory put forth by the MNS. The Jharkhand Disom Party has also let support to Maharashtra Navnirman Sena’s agitations against North Indians in Maharashtra. MNS organises functions to promote Marathi literature. MNS also holds training workshops for the youths to work in retail industry under its child organisation Navnirman Academy of Retail Industries. The Student wing named as the Maharashtra Navnirman Vidyarthi Sena is an upcoming organisation with a large number of college going youth . It is the only students wing to have a separate Girls, Cultural and Sports cell. It is headed by Aditya Shirodkar, the son of lawyer Rajan Shirodkar . MNS also organizes blood donation camps. महोदय, मी नाशिककर. महाराष्ट्र नवनिर्माण सेनेबद्‌दल मला सार्थ अभिमान आहे. नाशिकमधील नव्याने होत असलेली व झालेली विकासकामे अभिमानास्पद आहेत. त्याबद्दल आपले अभिनंदन. परंतू आपल्या नाशिकची वाटचाल ही स्मार्ट सिटीकडे असतांनाच आपल्या कार्यालयासमोरच चोरी सारखे प्रकार घडावेत ही बाब लज्जास्पद आहेत. आपल्या कार्यालयात चौकशी केली असता तसेच नवीन बस स्थानकात कुठल्याही प्रकारचे सीसीटीव्ही कॅमेरे नाहीत. सुरक्षितता नाहीत. महाराष्ट्र नवनिर्माण सेनेची महापालिकेत सत्ता असतांना चोरी सारखे प्रकार घडावेत तेही सत्ताधारी पक्षाच्या कार्यालयासमोरच. मंगळवार, ता. 29/3/2016 रोजी पहाटे 4.30 च्या सुमारास मी आपल्या कार्यालयासमोर दुचाकी पार्क केली होती. व पूणे येथे शासकीय कामानिमित्ताने गेलो असता, दुसऱ्या दिवशी ता. 30 रोजी रात्री 8.30 च्या सुमारास परत आलो तर माझ्या दुचाकीचे ट्युब पूर्णपणे निकामी करून गाडीतील 200 रूपयांचे पेट्रोल चोरले गेले. पेट्रोलची नळी मोकळी सोडून दिली. गाडीवरील कव्हर चोरले गेले. त्यादिवशी मोर्चा असल्याने सर्वच दुरूस्तीची दुकाने बंद असल्याने 4 किमी गाडी लोटत न्यावी लागली. आसपास चोरीची चौकशी केली असता उत्तरे “”बरं तरी पेट्रोल, चादर चोरली अन गाडी पंच्चर केली, गाडीही चोरी गेली असती.” जर अशीच स्थिती नाशिकमधील असेल तर तेही सत्ताधारी कार्यालयासमोर तर नाशिकचा स्मार्ट सिटीकडे सुरू असलेली वाटचाल शुन्य आहे. आपल्या कार्यालयाच्या अवतीभोवती तसेच नवीन बस स्थानकात सीसीटीव्ही कॅमेरे बसवून सुरक्षीतता वाढवावी. या ठिकाणी असलेले ठवाळखोर, चोरी करणारे, तसेच भिकारीरूपी चोर त्वरीत यांचा बंदोबस्त करून प्रवाशांच्या सुरक्षिततेत वाढ करावी. प्रवाशांना होणारे खाजगी वाहनधारकांपासूनचा आग्रह, तसेच त्रास कमी व्हावा यादृष्टीने प्रयत्न करणे. (खाजगी वाहनधारक प्रवाशांची बॅग धरून खेचून चला, स्वताच जाऊ, लगेच निघणार गाडी) हे प्रकार टाळावेत. याठिकाणी मोठ्या प्रमाणात असलेले भिकारी यांची योग्य ते सोय करावी. जेणेकरून सर्वसामान्य जनतेला त्रास होणार नाही. Swarch bharat is just an imaginary point. People say we are in swach bharat mission. Ek jhadu marun selfie kadnare he kasle swach bharat. Swach bharat ek dhong ahe. govandi cha nala bhaga, kurla chi gatar bhaga., andheri cha nala bhaga, he kadhi saaf karnar, raj saheb tumhi amchi asha ahe. Brastchar kami nahi zala wadla ahe, a.p.m.c market la property registration office la clerk ek divsat 3lac kamavtat, pagaar kiti tar 15000, ani gavi 1crore cha bungla, direct 1document cha 25000 rs ghetat, Ani tyancha varchya floor la anti coruption office ahe, anti corruption wale mhantat mandavli karun ghya..
Raj saheb tumhi amche daivat ahe, amhala vachva. बोलावल्यास मि माझे सर्व काही सोडुन येईल ही माझी खुप खुप ईच्छा आहे मि ईतःक्या कमी वयात ठाकरे साहेबांन सोबत राहावे असे वाटते धन्यवाद. Please reply on subject issue today at your Thane function. We,Marathis have enlarged the Jains,Gujjus and Marwadis to enormous size and now they are treating us in this manner . The best weapon of Gandhiji that is BOYCOTT should be used by Maharashtrians against these communities businesses.These people tell the builders not to sell flats to non-veg(Marathis)!! Also take Narayan Rane to task!! Please do not allow Pakistan actors to work in Indian films as none of them even condemned the brutal act done by attacking our soldiers when asleep. Please sir, save our country and we are not short of actors that the Indian directors and producers have to bring them to act in our Indian films. Jai Maharashtra, Jai Bharat Mata ki…..
नमस्कार मी प्रदीपकुमार बिभीषण जामदार परभणी त आहे मला आपल्या पक्ष्याचे काम नीस्वथ कार्य करायचे आहे. नमस्कार , मी नागपूरला राहतो ..आमचा नागपूरला शाळांमध्ये दिवाळीला फक्त ५ दिवस सुट्ट्या असतात. मी ऐकल आहे कि मनसे चा प्रयत्नांनी ठाणे मध्ये सगळ्या शाळा दिवाळीला १५ दिवस सुट्टी देतात. माझी विनंती आहे कि इथे दिवाळीला १५ दिवस सुट्ट्या द्याव्यात याकरता मदत करावी …. Saheb jay maharashtra jay MANASE, majhe naav Mayuresh chavan aahe me MNS chya survatipasunach pakshatala sakriya karyakarta ahe aadhi me chembur la rahayacho ani ata me kamothe navi mumbai ithe rahato, me 1 complaint karu icchito aaplya pakshatil milind khade(Kamothe)yani majhe 15000 rs majhya muliche admission karun deto mhanun february17 la ghetale hote pan ajoon hi tyani mala parat kele nahit, maitri aslya mule me NC hi karat nahi ahe, pan ata mala paishyachi khup garaj ahe to roj bolato aaj deto udya deto pan call hi uchat nahi, please saheb aapan hya madhe laksha ghalun mala majhe paise milave hya sathi prayatna karava hi vinanti…. Aatach zalelya navi mumbai mahanagar palika nivadnukit Milind khade chi wife Mrs. Anita Milind Khade ubhya hotya.